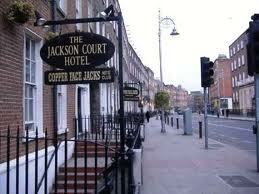 Situated as it is just up from St. Stephen’s Green in the centre of Dublin City the Jackson Court Hotel is definitely worth a try if you are interested in a relatively cheap stay. 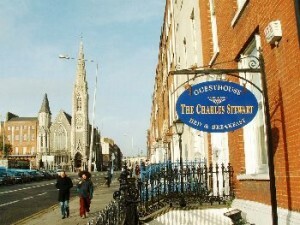 It is not, however, recommended for those who value a good night’s sleep as it has a club located on the ground floor. The staff, as we experienced, were quite friendly and whereas our booking went slightly awry (a story seemingly common if you were to read other reviews) we were provided with a room which was definitely worth the stay. Of course the club beneath thumping till 3 or 4 am wasn’t a sweet lullaby, at least not to the adults in the room. Our wee one, Tara, merely hopped to the beat for a period before finding dreamland beckoning. The location of the room on the top floor of the ‘wing without a lift’ was a reason to be dubious, especially with a kid and buggy in tow, but apart from the physical exertion required, and perhaps needed if the roundening belly is anything to go by, all went well in this respect. It wouldn’t be top of my list of recommended stays but if partying is what you’re in the Capital for then it is a pocket friendly alternative with the on the premises club offering a good solution on a rainy night. Be warned: As mentioned the club makes sleeping a chore but don’t be banking on this as merely a weekend drawback; the busiest night is Monday when the nurses and off-duty (I hope) police, known as Gardaí, come out to party, and boy do they! “Attracted by the price I’d have to say that it’s location is its forté. The club attached would be perfect for the late nighters but not for families methinks! No lift to some floors which is ok except with baby in tow. Mosonmagyaróvár is a relatively small town but its urban sprawl means that right at the peripheries there’s something to find, at least for the interested traveller. Heading out of town on the way back to the train station, following as best I could the No.1 bus route, there were supermarkets, local bars, and at one point a square with permanent stalls set up. Not surprisingly thereabouts a few more bars had mushroomed. Now if bars, or supermarkets, or abandoned market places aren’t your thing then doubling back to the town centre is advisable. With a tributary of the Danube running along the outskirts of the pedestrianised centre and a few church steeples jutting above the picturesque buildings the whole place offers a scenic first impression. But like most towns of its size, it quite quickly runs out of being. The thermal baths are also worth a visit as they are in any featured town in Hungary and the local coffee houses, and restaurants, are worth exploring, the rustic feel prominent. After that it’s time to hop on a bicycle, this being quite a cycle friendly place, and head out towards the Szigetköz, an area boasting a plethora of islets mingling, splitting the Danube up into rivulets and streams. It’s a web worthy of exploration. 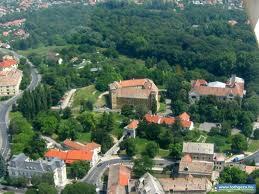 Situated in Northern Hungary, Eger is famous for its wines, baths and castle, among other things. The castle itself is central to the great historical story surrounding Eger as it is the site of a notable victory over the Turks. The Turkish armed forces, so dominant at the time, met with fierce resistance from within the walls of Eger and left with their tails between their legs. The minaret and baths, however, tell a further tale, the Hungarians finally succumbing to the Turkish might. Well, apart from the above mentioned sights, there are many others to see within the town, the cathedral definitely vying for top spot in this respect, but any good guide book will tell you more. My advice is to let the streets take you where they will, winding through the centre, climbing to the castle, and if in a moment, suddenly overwhelmed by a lack of direction, you should find yourself outside of the centre in The Valley of the Beautiful Woman don’t worry! You’ll not be lost at all. In fact you may just find yourself. Sample the wines from the myriad of wine cellars dotted about at the base of the rolling hills and with restaurants and other mobile eateries on hand you may just develop an urge to while away an afternoon lost among the Hobbiton-esque environs. Eger is also the spot of one of my intensive English weekend courses. Arriving on a Friday evening the weekend has two four-hour slots for General English with the option of 2-4 more hours for activity work, games, conversations etc. Evenings are left open to the students whim. However, as the teacher I am available in this free period for anything from a chat to personal questions concerning the course material etc. Quaint by the way of age; nothing is too modern, yet everything is convenient, comfortable. The joining corridor between the two flights of stairs, succumbs to the idea of age with its ramp-under-carpet feel, but a room off to the right, with computer screen glare, reminds one that the spit and polish amounts to an up-to-date operation, where still the old touches- the receptionist, the tea in the rooms, and the breakfast awaiting the refreshed travellers- are paramount. Thank God we found this place- and thank this place for everything else.